There are billion of persons who love to use Android smartphone. Most of the smartphone users love to use these smartphone due to it’s features. Most of the time we have to received lot’s of notification on our smartphone. Sometimes we have to miss these notification, but now this article will helps you to view lost notifications on Android phone. A notification is nothing, it is an message which is used to display on your mobile screen. It displays an notification as an icon on your Android screen. Most of the time we have to miss our important notifications, but now there is no need to worry. Lot of time we have to received different notification messages on the WhatsApp. These notification system allow to any smartphone user to get the latest information which is related to any app. But as per my opinion these notifications are very important for us. These notifications help us to get related information regarding any app in a regular interval on our smartphone screen. Step 1: Long press on an empty area on your Android home screen, now you will get different options. 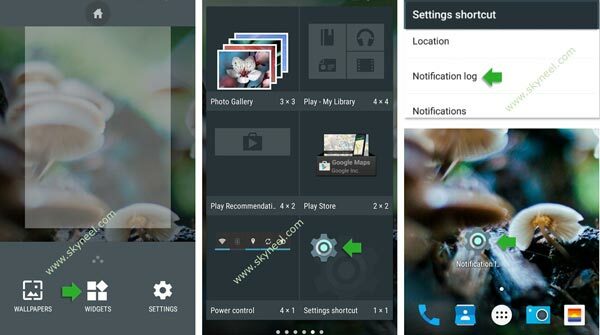 Tap on the Widgets option, there are lot of option you have to view on your Android screen. Step 2: Swipe left on your Android screen and locate the Settings shortcut option. Long tap on the Settings shortcut option. Now you will get different options in the settings shortcut windows. Step 3: Tap on the Notification log option in the Settings shortcut option. Now, you will get an Notification log shortcut icon on the Android screen. Tap on the Notification log option. Now, you will get the list of the Notification log option. Note: If you already view any received notifications then these notifications displays in gray colour, while rest of the unreaded notifications are highlighted on your Android phone Notification log window. I hope you this article will help you to view lost notifications on Android phone. If you have any suggestions regarding this article then write us in the comment box. Thanks to all.